As modern film award acceptance speeches go, it's a nanosecond long. The couple of minutes in which actor Julie Andrews received her 1964 Golden Globe award for her role in Mary Poppins encapsulate joy, thanks, and humor, as any good award acceptance does. But hers had one thing more, the thing that made it famous: A deft back-handed compliment to the man who didn't cast her in the lead of a competing film, My Fair Lady. Not just any man, either: Her target was Jack Warner, president of Warner Brothers, in front of a film industry crowd that laughed as much in surprise as at the cleverness of her speech. Like any good film, this has some backstory. Andrews was cast in the lead of My Fair Lady on Broadway in 1956, a role that requires serious singing skills as well as acting skills. The success of the stage version led to plans for a film. Warner Brothers paid an unprecedented $5 million for the film rights. And then they cast the decidedly non-singing actress, Audrey Hepburn--a choice seen as a major slight to Andrews. But the move freed her to consider Disney's film of Mary Poppins, which is what she was acknowledging when she said, "And, finally, my thanks to a man who made a wonderful movie and who made all this possible in the first place, Mr. Jack Warner." What can you learn from this famous speech, one of the shortest in our collection? 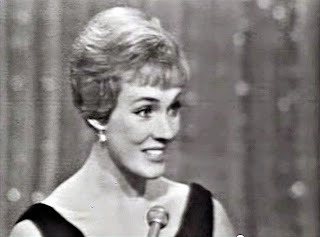 Shade thrown with a spoonful of sugar: Playing on the persona of her film character, always correct, Andrews managed a competitive one-two punch with such speed and charm that you might almost miss it--except that it wasn't lost on the audience at all. She merely praised Warner and thanked him, but the meaning was clear. It's a great bit of acting: She stayed in character as the sweet, polite woman while showing her competitive spirit. Speed and brevity help with a surgical strike: This rapid-fire bit of cleverness was over almost before it began, aiding its impact. Andrews didn't need to elaborate, and got the last laugh as a result. Andrews, a good actor, turned to look at Warner with sincerity as she began her last sentence, then turned straight to the audience, starting to laugh at her own joke--two good non-verbal underscores to her verbal punch. Use your endings for impact: Strong starts are important, but endings offer another opportunity for impact. Placing her dig at the end let Andrews leave the stage with the audience (including Warner) still reacting and applauding. Andrews got the last laugh in another way, winning best actress awards at this ceremony and at the Academy Awards. Watch the very short video, which includes interviews that tell the story, as well as the speech itself.